All wild birds (except pigeons, English sparrows and starlings) are protected by federal and state laws. You may not trap, kill or possess protected species without federal and state permits. So it is important for you to identify the bird and the next step would be to see what is attracting it. Your goal is to remove what attracts the bird, or build a barrier between the bird and what it finds so attractive. If in doubt, call your US Fish and Wildlife Service Regional Office for advice. Sick or Injured Birds: What to do when you see sick birds ... Baby Bird "Orphans"
The following text was adapted from (and added to) a US Fish and Wildlife Service pamphlet, "Homes for Birds". If you don't discourage them, these two pest species introduced from Europe will bully or kill cavity-nesting birds. 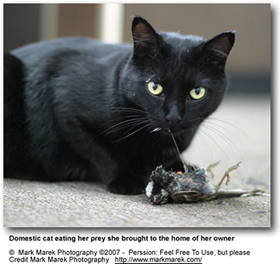 Since house sparrows and starlings are not protected by law, you may destroy their nests. But, remember, other birds are protected by law. At times house wrens interfere with the nesting success of other birds by puncturing their eggs. But unlike the sparrow and starling, these birds are part of the natural system. They are protected by law. Don't intervene. It is understandable that proud gardeners get upset when they see that their crop is being harvested by birds. The best way to keep them off the fruits are barriers. Hot caps (opaque plastic "hats" used to cover young plants to prevent freezing) and inverted crates can keep starlings from pulling up small plants. Netting may keep starlings, catbirds, orioles, robins, blackbirds and jays from your grapes, apples and raspberries. Scare techniques may repel birds from gardens. Placing feeders filled with sunflower, millet and nectar nearby may also distract birds. Koy enthusiasts get very upset when their prized koi fish are being eaten by fish-eating birds, such as gulls, terns, herons, egrets, kingfishers, diving ducks, pelicans, cormorants and ospreys. First try scare techniques (such as bird repellers), then exclusion. While they may be unsightly, physical barriers can deter most fish-eating birds. For small ponds, complete screening with bird netting may effective. Properly spaced monofilament lines suspended over a pond may exclude gulls (every 4 feet), mergansers (every 2 feet), and herons (every foot). Perimeter fences provide some protection from wading birds. Homeowners don't like the droppings piling up under a flock of roosting, especially if they roost on their roofs, their balcony railing, carport rafters, or and gulls basking on their boat dock. The problem is especially severe if they roost by hundreds or even thousands -- potentially creating a serious health hazard. Physical barriers may be the most effective way to control birds roosting on buildings. To eliminate birds on ledges try porcupine wire, stretching a "slinky" toy, or stringing rows of monofilament, one or two inches above each other about two feet apart. Sheet metal or hardware cloth placed at an angle on ledges may also make roosting more difficult. Pruning may eliminate birds roosting in trees. Removing some cover may be enough to make the roost site less attractive. Scare tactics may provide temporary relief. Birds often pick what seem to be the strangest places to nest:, such as people's gutters, clothes driers or kitchen fan vents, above their front doors, in hanging baskets, on window sills, or in shrubs near or at the house. House (or English) sparrows, pigeons and starlings are not protected by law. You may remove the nests, eggs and adults.Other wild birds, their eggs and nests may be protected by federal and state laws. You must have a federal permit to disturb the adults, nests or eggs.The most effective way to eliminate these problems is to discourage the bird before the nest is built by offering an alternative artificial "nest" nearby, but out of your way. If that doesn't work, contact a federal or state agent for advice. Resist the temptation to destroy the nest or harass the adults. People who raise free-range poultry or small animals, such as rabbits, have good reasons for wanting to keep birds of prey, such as hawks and owls, away for obvious reasons. Federal and state laws prohibit the capture, killing or possession of hawks and owls. The best solution to most raptor problems is prevention. Keep your pets indoors, and your livestock in pens. If you feed wild birds, expect a visit from a hungry hawk or owl. Raptors at a bird feeder are a problem only when they perch nearby all day. When they do, you are not likely to see any birds at your feeders. Stop filling your feeders for a couple of days, and the raptors will look for dinner elsewhere. NOTE: ALL bird control methods prove more effective when different types of scare devices are used in combination, such as sonic bird repellants and visual / scare bird repellants. Bird Spikes are cost effective and almost invisible when installed. They can be installed onto virtually any surface and are generally easy to install and maintain. A humane bird proofing method and high quality ensures it's long lasting. Bird Spikes are the easiest and most effective way of preventing nuisance pigeons, gulls and starlings from perching and roosting on your buildings, fences etc. Bird Gel - A non-toxic, sticky chemical makes a surface tacky and uncomfortable to birds Effective against pigeons, starlings and sparrows. Ideal for use on ledges, signs, windowsills, gutters, cornices, ornamental copings and protruding beams or any other surface where birds roost or perch. Bird gel - use in any weather condition - indoors or outside. Visual Bird Control: One method of dealing with unwanted birds is to scare them away using sonic devices or visual bird control. Sonic bird scarers send out both distress calls and predator warning signals, thus scaring unwanted birds away from your property. Visual scares devices are far cheaper, but require moving the objects around the property and creating a threatening environment. Life-sized scaring owls, predator eye balloons and the old-fashioned scare crows, for example, have shown effectiveness. Bird Nets produce a physical barrier so birds are not able to perch or roost at your property. The principle of the bird net is that a highly tensioned wire rope is fitted around the perimeter of the net. The wire rope is then anchored using corner brackets, which takes the weight of the net, and lighter intermediate fittings hold the wire close to the structure being proofed. The bird net is then attached to the wire. bird netting is one of the most popular methods of bird control. It’s suitable for all levels of bird infestation, it’s versatile, discreet, durable and humane. Other measures that some people have effectively employed including playing a radio loudly in the backyard - which is fine as long as the neighbors don't complain. If you wish to attract birds to your yard, keep in mind that many herbicides, insecticides and fertilizers are deadly poisons. Ornithologists have known for several years that many lawn-care chemicals kill songbirds and contaminate their food. Mechanical and biological techniques may provide less hazardous pest control options. Please visit the Green and Healthy website for tips on how to control weeds and unwanted insects in your garden. Attracting the Right Birds: Many homeowners wanting to attract birds of their choice, do so by putting up nesting boxes. Almost two dozen species will consider a human-made nest. The problem is how do you make sure the right animal is using your bird nest? Learn all you can about the birds you want to attract and offer them a box that opens at the top and the front or side. Monitor the nest box, and evict starlings and house sparrows. If you find birds attacking the adults, eggs or nestlings, what you can do depends on the perpetrators. You could choose to eliminate house sparrows and starlings (although it is not something that I would do or like to see.). All other birds are protected by federal and state laws. You may not harass or otherwise harm hawks, owls, falcons, crows, grackles, jays and shrikes. If snakes and climbing mammals are a problem, use physical barriers to deter them. Try a PVC pipe over your metal bird house pole, or metal sheeting on a tree or wood pole. Smear the PVC or metal with Vaseline laced with hot (cayenne) pepper. Avoid automotive grease, it can be lethal to wildlife. Put a predator guard over the nest entrance hole. Do not use bird houses with perches below the entrance hole. The safest solution to insect infestations is physical removal and soaping the inside top of the box. If insects infest the box during nesting, apply a light dusting of rotenone or pyrethrin. Do not use chemical sprays. Some poorly designed bird feeders can actually lure the birds inside, where they become confused and may die in a panic. Avoid clear plastic feeders with feeding ports an inch or larger in diameter. Chickadees will squeeze inside to get that last seed, and try to fly upward and out, forgetting the entrance is at the bottom. The same can happen in a wood hopper feeder with plastic walls tight to the roof. If you're going on vacation, never leave your feeder full. It's better to take it down than take the chance that a bird will become trapped. Birds are attracted to sunflower because of its high oil content. Some of that oil saturates the shell. If you don't remove the spent shells, rodents are attracted to the smell. The obvious solution is to rake up the shells. An easier way to eliminate the shell problem is to use hulled sunflower (also known as sunflower hearts or chips). Regardless of which seed you use, store it in a metal garbage can in a cool, dry place. Seed will turn rancid when it sits in a hot garage or shed in the summer. To avoid insect infestations in warm weather, don't store more seed than you can use in a couple of weeks. Put the seed in a feeder where it's dry and protected from contamination. Bird baths can present problems to birds if they are too deep (small birds can drown in three inches of water) or the water is dirty (birds drink, bathe and defecate at a bath). Hose out the bath daily and wash it with hot, soapy water at least once a week. Add liquid bleach or, even better, 3% hydrogen peroxide to the soapy water to help kill algae and bacteria. Winter is the most important time to offer water. There's no easy way to keep water from freezing. Contrary to some reports in the popular media, glycerin and antifreeze will kill birds. The only way to keep water from freezing is to add an electric water warmer. Be careful with electricity and water. Use a UL (Underwriters Laboratory) listed warmer, and connect your appliance to a GFIC (ground-fault interrupt circuit) outdoor socket. Pet dogs are a hazard to nestlings in the spring and summer. All it takes is one swift bite and the baby bird is gone. Don't let your dog or cat run loose during nesting time. Stop other dogs from entering your yard through proper fencing. Raccoons and opossums will stick their arms inside nest boxes and try to pull out the adult, young, and eggs. Adding a predator guard to the bird house or to its pole support is a simple solution. Putting out food for your pet dog or cat will also invite these critters to your yard. Snakes are an important part of the natural balance between predator and prey. If you find one of these reptiles in your bird house, please don't kill it. Snake-proof your house by putting it on a metal pole lathered with vaseline or hot red cayenne pepper. Many insects infest bird houses. You should inspect your bird houses for signs of mites, gypsy moths, blow flies, wasps, ants, gnats, and bees. You can keep bees and wasps from attaching their nests by coating the inside of the roof with bar soap. In areas where gypsy moths abound, avoid placing boxes in oak trees, which are favored by the gypsy moths. Pyrethrin and rotenone insecticides are recommended for killing fly larvae, bird lice, and mites after birds have finished nesting for the season.